Healthcare - VIGO System S.A. There are great hopes that the VIGO System detectors will perform well in medical applications. It is sufficient to say that the Polish sensors enable absolutely non-invasive blood analysis. Successful attempts at measuring oxygen saturation, blood flow, and even glucose content have been documented, with an error rate comparable to that shown by traditional glucose meters. All that has been achieved with the use of infrared detectors, by means of analyzing the spectrum of laser radiation reflected from parts of human body supplied with large amounts of blood. There are also commercially available devices on the market that utilize technologies developed by VIGO System. Those are apparatuses for exhaled air analysis. They enable determining tumor marker levels, or diagnosing asthma or liver diseases. 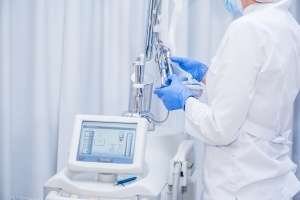 Such devices can be used also for monitoring the composition of air in operating rooms. In addition, the detectors supplied by VIGO System are used for controlling the power and positioning of laser beams used by surgeons, dentists or dermatologists.